Who knew that the influence of the beloved 1988 comedy Big would be felt so strongly in 2019? In addition to the reboot (of sorts) coming out on April 12 called Little, there are also quite a few parallels to the Tom Hanks film in DC's latest superhero outing, Shazam!. Warning: Very, very mild spoilers for Shazam! below! 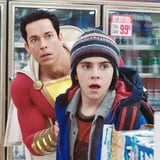 The film about the titular DC superhero takes a refreshing break from the bleak, gritty stories found in Batman v Superman and Man of Steel, instead letting star Zachary Levi run wild as the powerful adult alter ego of teenager Billy Batson (Disney Channel star Asher Angel). After running away from countless foster homes in a tireless (and heartbreaking) search for his birth mom, Billy is given a special gift from the ancient Wizard Shazam, who tells him that if he utters his name ("Shazam!") he'll gain superpowers. He does, promptly turning into an older, far more muscular, bulletproof crime-fighter in a red and yellow suit. Oh, and he can also shoot lightning bolts from his hands. Obviously, the idea of a kid magically growing up to experience the highs (and lows) of adulthood will give anyone who's seen Big déjà vu. In the Penny Marshall film, Hanks stars as the grown-up version of a kid named Josh, who wakes up as an adult after making a wish "to be big" at an antique arcade fortune teller machine called Zoltar. He goes on to work at a toy company, MacMillan Toys, and shares a scene with the CEO (Robert Loggia) that involves the two of them playing "Heart and Soul" on a big walking piano in FAO Schwarz. It's iconic (and adorable), and Shazam! pays homage to the scene briefly during a showdown between Billy's Shazam and the film's villain, Dr. Thaddeus Sivana (Mark Strong). Once the evil Sivana, who has come into some powers of his own, discovers who Shazam is, the pair face off and prove to be on relatively equal footing. (Though Shazam is indestructible from bullets, knives, and the like, being attacked by magical powers can cripple and weaken him.) They crash through a few buildings in Philadelphia until they end up inside of a toy store in the mall. As Shazam dodges through the aisles in an effort to escape Sivana, he plows by customers and hurls a bunch of Batman action figures at Sivana's head to try to slow him down. They finally come face to face at the front of the store, where they - wait for it - find themselves inadvertently playing a few notes on a giant walking piano. Thus, the perfect Big Easter egg was born.